Everyone in today’s time suffers from laziness in some part of their life, whether young or old. People know that being lazy is a very unhealthy way of living their life. If they want to remove this bad habit out of their system, then they need do something about it, to change themselves. If not, they continue developing a pattern of being lazy consistently in their life. This leads to lose any kind of motivation which can help them. Changing the way a person can manage their time and their life if they are lazy is possible, but difficult. 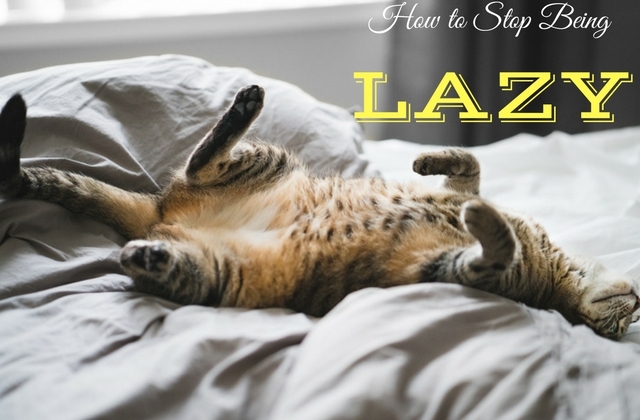 Some tips have been mentioned below on how a person can stop being lazy and not let laziness affect their life to get more work done. For an average adult, they need to atleast get 8 hours of sleep daily. So the ideal sleeping duration everyday should be at least 8 hours and the person needs to follow this regularly. They need to maintain a strict schedule when it comes to their sleeping. If they do not do so, then they will keep having an irregular sleeping pattern. This can even lead to a person having sleepless nights from time to time and so they will have low energy and continue remaining lazy. As soon as a person gets up in the morning, they should go and wash their face with cold water and freshen up. Washing face really freshens up the person which helps them to carry on their daily work and their routine. On doing this the person knows that they shouldn’t continue being lazy in their house. This being an easy way to wake up a person, it will even help them in starting off the day in a positive and in the right way. Exercise has always been a proven way to get rid of the laziness within a person. Even something as a small brisk walk early in the morning can give the person energy in them naturally. It also releases endorphins from the body which can help in improving the overall mood of the person for the entire day. It makes the person motivated that they need to go out and accomplish something for that day and make it a fruitful one. The reason that the person is being lazy would even be because they aren’t getting the right amount of nourishment everyday. Not getting the required amount of fruits and vegetables may also affect the person’s overall energy. Keep having regular meals for the day and limit or stop the amount of junk food eaten. If the person wishes to have a small snack then having a healthy one like a fruit is more beneficial then having chips. If the above mentioned habits aren’t helping the individual then the cause of the laziness might be something else. The person may be suffering through some sort of depression or any kind of rare mental disorder. At some times, the person may not even be aware of such a situation. So they should act fast and get some help from outside. Seeking professional help will let the person get rid of their laziness as fast as possible. The reason for laziness or reason a person starts feeling lazy are mainly related at times to how the person is feeling about themselves in their life. Feeling right mentally in the mind is very important for the person if they want to stop laziness or fight laziness. Some ways of improving a person’s mood have been mentioned below and the individual should try practising them. One way would be to have an environment which is clean in the personal as well as the professional life. Having an environment which is clean and free of any kind of clutter or mess can even help remove any clutter if present in the mind of the person. On doing this, the person can feel more motivated about them. They get a sense that they want to be more productive as the day goes by and effectively remove laziness from them. Any negative or de-motivating thought first comes from the mind of an individual itself. So the best way of motivation is self motivation. When a person motivates themselves, they can achieve their objectives. If a person says statements such as, “Today, I will go for a run” or “Today, I will complete all my tasks.” can help them. So starting the day by positively speaking to themselves is one of the best ways to get rid of laziness and clearing up any negative thoughts in the mind. Listening to some soothing and relaxing music can really calm down a person. They can start to behave in a fresh as well as an active person. While exercising or working out, the person can listen to their favourite sound tracks. This will help them get pumped up and get energized. This will also set up a positive tone for them for the rest of the day and it will remove the laziness out of them. So they can carry on the rest of their day in an active and a positive way. Always remember that a different environment always has a different impact on the person and their productivity. For example, if a person wants to carry out their work in the bedroom, they know that their bed is just right there. Their laziness can even tempt them to take a nap and go off to sleep on the bed. So the person should change their entire work environment before they begin their tasks. So consider a different space before doing and accomplishing a task. When a person surrounds themselves around productive people it can help them in a very positive way. Their productive and energetic behaviour can help inspire the behaviour of the person. And the laziness within the person may also go away for a really long time. So the person should hang out with such people in their everyday life. People who are successful as well as motivated to work. Thus, it is likely that their energy will be transmitted into them. A person always has a specific goal in their life. They would mainly like to keep this goal to themselves only and may not have a sharing nature. But in this case, sharing the goals with other people can actually help a lot. Later on whenever the person meets such people, they will ask them about how their life is going on with those goals. Then they can answer for themselves, whether they have been lazy or actually done something productive and can remove the laziness out of them. The person may be waiting for a long time wanting to accomplish something in their life. But they also may be waiting for the right and perfect time to do so. But for a person who is lazy, such a time may never come. The person looks to being perfect rather than doing things in the right way. This makes them more tired and lazier as it drains out the energy out of them. And with this, procrastination starts beginning their life. So it is best to keep things simple enough and do not let the situation of over complication arise. The busy person may have a lot of things to do in their life. So they need to make a list of all the important things to be done for the day. They need to prioritize all their tasks in sections such as; have to do, need to be done and got to be done. The ones marked with have to do need to be done first as soon as possible. So having things written out first on a piece of paper gets to know faster what has to be done and what is important. At this stage, the energy within the person hasn’t yet come out and been expanded just yet. So they should do any of the written unpleasant tasks later on in the day. If the person first focuses on the easier tasks, then they can get enough time to work for the other tasks later on. Always know that things that are disliked by the person will always take time. If they do this at the beginning itself, it will drain out energy and make them lazy. When certain task is in progress, entire focus on it is very important. With lack of focus, two things happen; the person starts losing energy faster making them lazy and the task too hasn’t been completed properly. So the person shouldn’t be overwhelmed by the ongoing situation. They should instead pick out one or two things out in particular first. Then they should fully devote their time towards that task. Work can always be seen overwhelming in front of the individual. So breaking down work into smaller parts can really work well. Individual parts can help first improve the focus of the individual. Improvement of focus can help avoid any unnecessary loss of energy. This in turn will reduce any kind of laziness arriving inside the individual. Assigning a deadline for the tasks can entirely change the person’s behaviour to it. When a person is lazy they are bound to push off things until the last moments. Assigning a deadline provides a person with a due date for the task. Providing a deadline gives the person a reasonable time frame to carry out their work. This will even provide relief from any kind of lazy habits within them. Using any kind of free and vacant time well is very important to remove laziness from the person. Taking interest in any kind of hobby can make time used in a fruitful way. A lazy person would often want to lie down and relax in this situation. But it is up to the person whether or not they wish to be productive. The sooner they become productive, the sooner they can remove the bad habit of laziness from within themselves. Always remember, there isn’t any actual cure for a person who is lazy or for laziness. The main way by which laziness can be overcome would be when the person decides to do so. The person should have a sense of self discipline within them and adopt a lifestyle of being punctual. Then only they can set their mind towards such a task and complete it. So just going out and doing what is done best is the most efficient way to get rid of any laziness present within an individual.